I really didn't learn to cook until I got married. And there are some things I do better than others, but I make a good pot of soup. It's easy, it's generally healthy. Soup is a perfect food. I've also thought, for some time, that soup replaces lost tears. I haven't been crying a lot recently, but year-to-date, I decided to make a little soup for dinner to even things out. This is my most recent obsession - I stumbled onto it when a friend on Facebook recommended it. 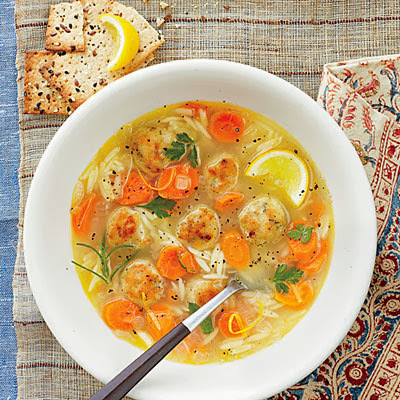 It's easy, it combines lemon, meatballs and rosemary, in a broth that would restore even the most lachrymose blogger. Here's the recipe. Go, make it. I cannot say enough good things about this soup.